Not so very long ago, the idea of nurses working from home seemed unattainable. After all, nurses need to be in the same space as the patients they help, right? 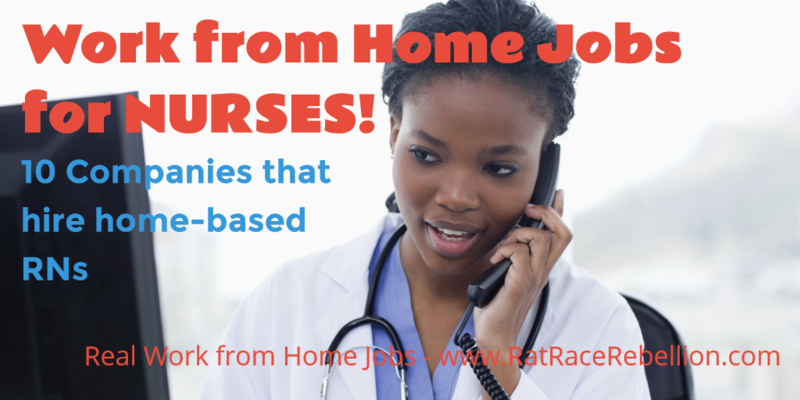 Following are ten companies that routinely hire home-based nurses for a wide variety of positions. If you are a Registered Nurse, or know an RN who would love to work from home, this list is for you! Click here to see their work from home jobs. Enter NURSE in the “Keyword” field > select “Virtual/Work At Home” from the “Work Environment Type” menu > click the Search button. Anthem regularly posts jobs for nurse care managers and other roles. Click here to see the latest work from home jobs. Hiring in the US and Canada, McKesson hires RNs to work in a variety of positions. In some roles, you will need to travel to see patients in the region. Carenet hires Registered Nurses to service their clients via telephone. Services include Nurse Triage, Medical Decision Support, Medical Device Monitoring Services, Member Engagement Initiatives and Healthcare Support programs. FONEMED hires Registered Nurses provide telephone triage and health advice to callers across North America. See all of their telecommuting positions here. Many insurance companies have jumped on the work from home bandwagon in a big way, and Cigna is toward the head of the pack. See their open positions here. Click “Search openings” > enter NURSE in “Keyword” field > select “Yes” in the “Potential Telework Position” menu > click on the “Search” button. To see their positions, click here. Enter NURSE in the “Job Title” field > click the search button (magnifying glass) > look for “Yes” under the “Remote Worker Option” column. This New York based health insurance company frequently posts positions for nurses to work as case managers. They may require that you train on-site in New York. Click here for to see their current work from home positions. Hires home-based case managers and utilization review nurses on a regular basis. Click here to see all of their telecommuting positions. This entry was posted in Hiring Companies, Nurses, Work at Home Jobs and tagged Aetna, Cigna, FONEMED, McKesson, medical, nurses, RN, The Hartford, UnitedHealth Group. Bookmark the permalink.